It is pretty interesting to see the tablet form factor making waves in the market, and all of it was due to the Apple iPad making a pretty huge splash when it was released last year. Well, it doesn’t look as though tablets are going to go away anytime soon, what with more than a hundred of them getting announced at CES last month. Since tablets are here to stay, here is a surefire method to make sure your kids do not enter school obsolete – expose them to the world of tablets from early on with the LeapFrog Explorer. This multifunctional learning tablet will be able to usher in the next generation of learning, digital reading and personal creativity for children ages four and up, where it will hit global English markets this summer. 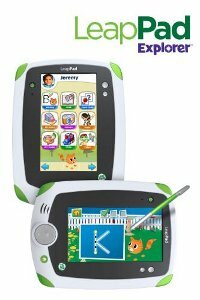 Just in case you were wondering how come the LeapPad Explorer looks so familiar, that is because it has its roots in the 2010 Educational Toy of The Year Award winner, the Leapster Explorer. Similar to an adult tablet, the LeapPad Explorer works slightly differently due to its kid-centric nature, offering endless fun experiences for kids, housed in a durable package (but of course, did you expect anything less?). It offers the largest ever learning library at launch with over a century of learning games, videos, e-Books and flash cards amongst others to choose from. Not only that, the curriculum on offer makes sure it covers all ground, ranging from spelling to phonics skills, mathematics, creativity, science, music, geography, and more. With its included stylus, kids are also able to give their writing some much needed practice. The LeapFrog Explorer is also proud to be the first kids tablet that sports a built-in camera, video recorder, microphone, and animation studio, letting one express him or herself creatively, while sharing said fruits of their labor with family and friends. The tablet is smart enough to adjust the learning across experiences automatically, letting your little ones learn at their own pace. The LeapPad Explorer will hit the market for $99.99, where it can be further augmented with downloadable applications priced at $7.50 and above, with game cartridges going for $24.99.